Thanks to the Internet and social media, customers are savvier now than ever before. Although this sounds like a good thing, the net result is an increase in stress for customer service professionals. According to Newsweek magazine, the stress level of customer service representatives is comparable to that of air-traffic controllers and police officers. To be clear, the role of customer service now ranks as one of the 10 most stressful jobs in the U.S.
One of the things I’m working on right now is how to find ways to relieve the stress contact center agents face on a daily basis. It’s hard to get verbally abused daily and to have to deal with constant phone calls and emails all day. Dealing with the customer who demands to speak to your supervisor is stressful. The right approach to this customer will result in a less stressful situation for you. When a customer asks to talk to a supervisor, don’t refuse. That’s what is known as “pushing.” If a customer is pressed, they will push back. Meaning they will be more difficult. Don’t only say, “Ok. Hold while I transfer you.” You don’t want to sound dismissive or flippant. Besides, you are a customer service professional. You are paid for your expertise, diplomacy, and knowledge. You know, I know, and your supervisor knows that you have all the skill you need to help any customer that shows up on your phone. So, make a reasonable effort to try to help the customer. Try responding to the customer who asks to speak to your supervisor using the U S A method. Understanding Statement. Don’t say anything to the customer who asks for a supervisor without first demonstrating that you fully understand their frustration (or whatever it is they are feeling). It is essential that the customer feels you know the inconvenience or problem they have experienced. If they don’t feel you understand what they are feeling, they may become more difficult, and the call will most likely escalate. Situation. Explain the situation. That is, explain that you can and would very much like to help the customer. Action. Convey to the customer that if you aren’t able to help them, you will let them speak to a supervisor. That is the action you commit to taking. This is not a “magic wand” approach, but in many cases, when you demonstrate empathy with an understanding statement, explain the situation, and tell the customer what you can do, you will be doing your very best. When you respond to the request for a supervisor with the USA method, you will find that fewer calls have to be escalated to your supervisors and that you are more confident in your response. In this video, I offer three additional tips for de-escalation. Imagine sitting in a local coffee shop that’s nestled in a bookstore, and talking over a latte with Myra about ways to help your employees deliver the best possible customer experience and ways to help reduce stress on your employees as they deal with demanding customers. 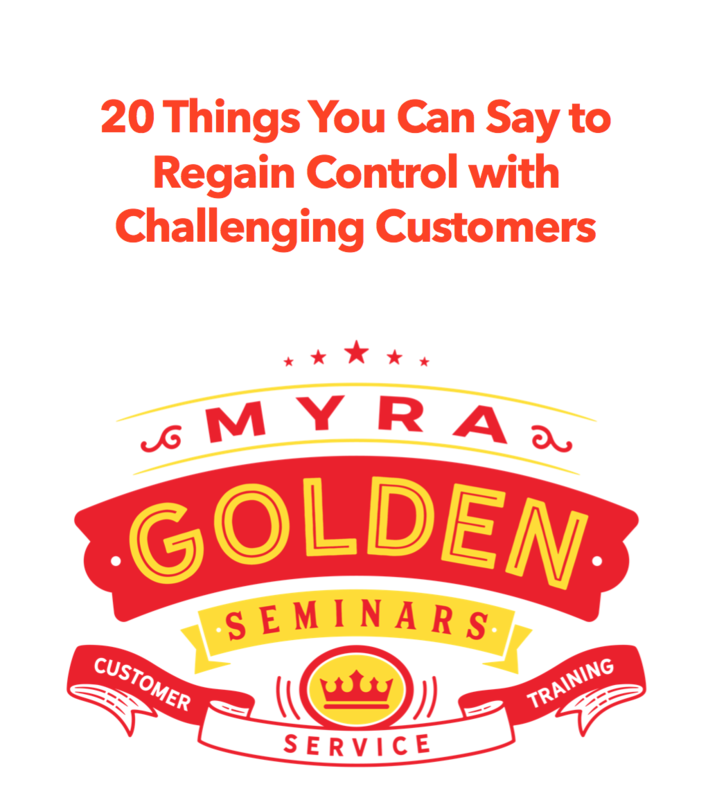 Every week, often literally from a coffee shop, Myra gives you ideas that in one way or another is actionable towards improving your customer experience. Sign up and join Myra over coffee every week.